The way we pay for stuff in the United States is changing — pretty quickly. And it’s worth paying attention to the shifts, especially because they’ll affect your day to day both as a small business owner and a consumer. Change can be overwhelming. From chip cards (EMV) to new mobile payments technologies like NFC and contactless payments—staying on top of it all can be a lot (especially when you’re running a small business). So we put together a quick run-down of all of the upcoming payment technology changes that will affect you as a small business owner. Two things to know before we dive in. 1) All of these changes are a good thing. They represent a movement towards more secure, authenticated ways to pay (aka less fraud). 2) The Square contactless and chip reader will arm you with the latest, most secure payments technology, and allow you to safely accept any form of payment (including EMV and NFC) from customers who walk through your door. Yes, people are paying with cards more. But now, they’re paying with a specific type of card — chip cards (aka EMV cards). The recent nationwide shift to EMV cards is one of the most critical things to have on your radar. The gist of it is that the United States is phasing out magnetic-stripe cards in favor of EMV cards, which are way more secure (aka harder to counterfeit). How does this directly affect you? Your business will need a new processing system to be able to accept the new cards. You can order the Square contactless and chip reader here. The liability shift is a key reason you’ll want to switch up your point-of-sale system soon. Because as of last fall (October, to be precise), you could be on the hook for certain types of fraudulent transactions if you aren’t set up to accept EMV cards. Increasingly, people will want to pay by tapping their phone, watch, or card. The most buzzed-about examples of such contactless payments are Apple Pay and Android Pay. Besides the cool factor, there are three main reasons why contactless payments are likely where things are headed: 1) They’re really, really secure; 2) They’re really, really fast; and 3) They’re really, really convenient. Contactless payments are locked down against fraud because the transaction includes multiple layers of encryption to protect your customers’ payment details. And in terms of speed, they leave cash, magnetic-stripe, and EMV payments in the dust. In an Apple Pay transaction, all a customer has to do is hold up his or her phone to the payment device (like the Square contactless and chip reader), and the entire transaction is over in just seconds. As for the convenience factor, well, there’s no need to carry around a George Costanza–style wallet anymore. There’s a lot happening, but it’s all good stuff. These payment technology changes will make doing business more secure, faster, and more convenient for both you and your customers. 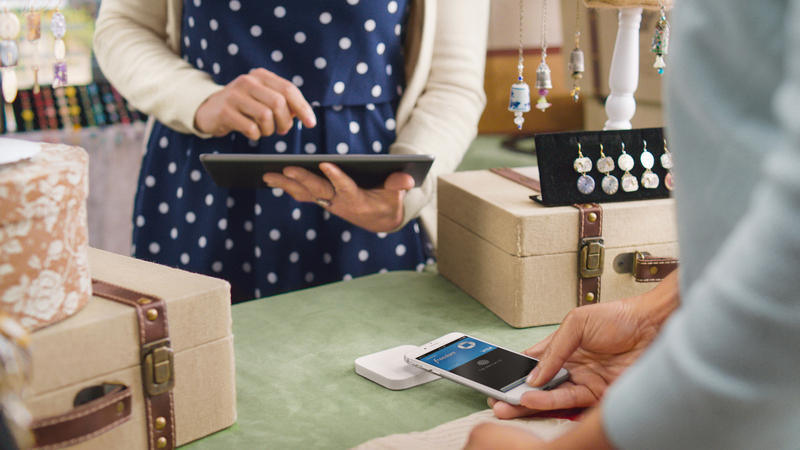 Square’s here to make sure you have all the tools you need to safely accept any form of payment from your customers. You can pre-order the Square contactless and chip reader to get all set up.